SONC offers 12 different events in performance and gymkhana. Performance classes showcase the ability of the athlete to control the horse and follow verbal instructions as well as learned patterns. Gymhkana, also called games events, are timed events in which an athlete or team must complete certain tasks while racing the clock! These patterns are valid for the 2018 SONC Equestrian Tournament. All initial and re-certifications for equestrian (including leaders/sidewalkers) must be done through a training school. Please contact Brad Glazer on our Equestrian Sport Development Team if you have questions about certification. Equestrian certification along with a few other certifications must be updated every three years; you can check the status of theses certifications here. Click here for a full list of Equestrian Tournament registration forms. The annual SONC Equestrian Tournament will be held September 28-30, 2018 in Raleigh at the James B. Hunt Horse Complex. About Equestrian: Equestrian is one of the most complicated, yet best-organized sports that Special Olympics North Carolina offers. Athletes compete in a stand-alone Equestrian Tournament. The balance, the stability and the right communication between the horse and the rider is a key element for success in Equestrian. 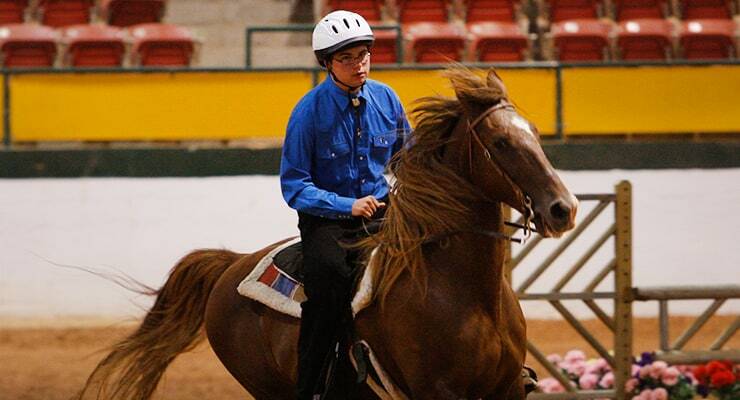 Differences of Special Olympics Equestrian: Special Olympics Equestrian encompasses several disciplines. Riders may choose either English or Western tack and enter the appropriate classes. Currently, Dressage is the only Special Olympics event that parallels FEI. Other events have been chosen to offer a wide range of activities that athletes can participate in successfully. Equitation is judged on the rider’s position and ability to influence the horse and is the basis for determining divisions. History: 1990 marked the establishment of the SONC Equestrian Development Team. In 1993, only thirteen local programs offered Equestrian as a sport, but now there are fifty-eight programs serving over five hundred athletes. Equestrian athletes participate in twelve unique events that showcase control and speed. The Special Olympics North Carolina Equestrian Championship (now Tournament) has been held the James B. Hunt Horse Complex since the inception in 1989.